Convenience voting, defined as access to voting at a time and place of the voter's choosing, has grown exponentially in the United States within the last two decades. A majority of states now permit "no-fault" or "no excuse" absentee voting, early in person voting, and vote-by-mail (VBM). 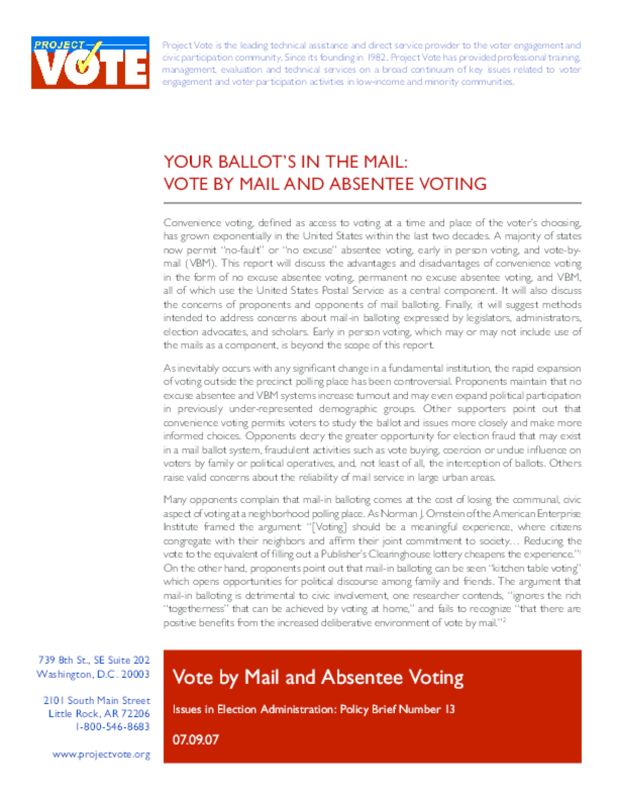 This report will discuss the advantages and disadvantages of convenience voting in the form of no excuse absentee voting, permanent no excuse absentee voting, and VBM, all of which use the United States Postal Service as a central component. It will also discuss the concerns of proponents and opponents of mail balloting. Finally, it will suggest methods intended to address concerns about mail-in balloting expressed by legislators, administrators, election advocates, and scholars. Early in person voting, which may or may not include use of the mails as a component, is beyond the scope of this report. Copyright 2007 Project Vote. All rights reserved.